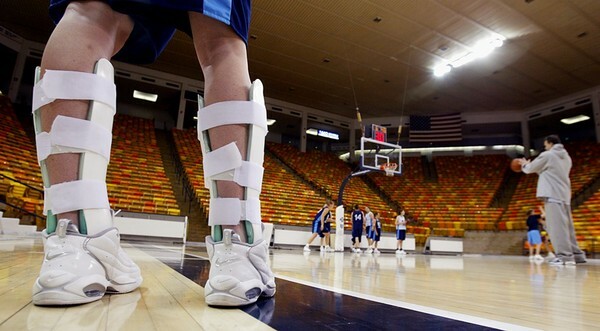 9/30/03 --- UTAH STATE WOMEN'S BASKETBALL --- LOGAN, UT: Tiffany Peterson watches her teammates practice, wearing braces on her legs to help heal an injury. Utah State reinstated its women's basketball program on March 5, 2002 after a 17-year absence and will play their first game Nov. 21. against Southern Utah University. Photo by Robert Hanashiro, USA TODAY.